Hi, my name is Lou Contaldi and I’m addicted to 16-bit 2D platformers. Call it what you will: hipster, nostalgia, retro—I don’t care. There is just something about NES copycats that harkens back to the cartridge glory days. So while the clever title of MagicalTimeBean’s Escape Goat pulled me in, the real draw was the encapsulation of a 90’s era style—a tool the game employs at any chance possible. Paired with addictive twitch gameplay and masterful level designs, the game gave me the retro fix I was asking for. Escape Goat’s plotline can be described with little fanfare. You are a goat that has been imprisoned for witchcraft. Using the help of your magical mouse, you awaken the sleeping sheep around the prison in order to find the exit. Escape Goat is a game that derives more of the story from their tongue-in-cheek title than any other source. Adequately named, the game focuses on a goat trying to escape a prison—not much more to it than that. On one side, historically platformers lack intricate stories. The kings of platformers (Mario, Sonic, Crash) infamously had the most basic of plot lines. On the other side of the argument, this was often due to technological limitations. Within the platformer genre, stories have become increasingly intricate. Indie blockbusters like Fez and Braid steal the limelight, making Escape Goat seem pale in comparison. 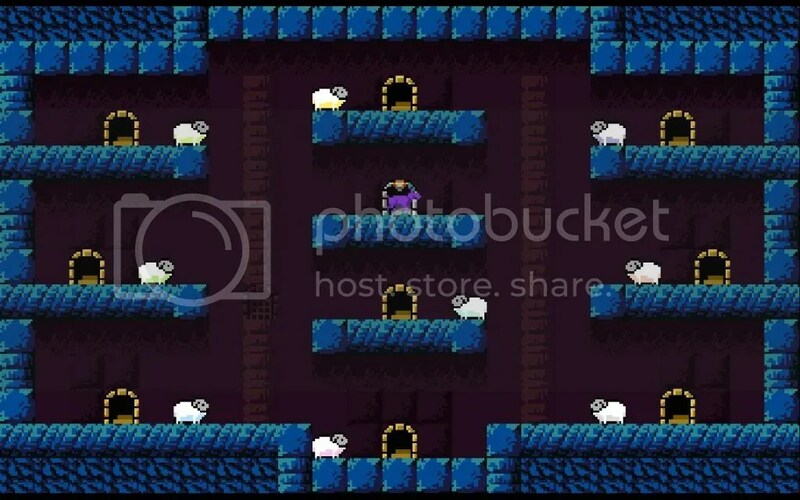 Escape Goat tries to capitalize on the 8-bit motif within all of its various elements. The graphics and sprites aren’t going to win any awards, but it is clear that it is to fit the style rather than for lack of trying. The environment is, at times, reminiscent the Castlevania series—a connection the developers were undoubtedly going for. Following in tandem, the menus are rudimentary serving their essential functions. While the graphics of 8-bit games are generally underwhelming by nature, the music is anything but. The soundtrack, crafted by Ian Stocker, hits all of the high points of 8-bit music. The heavy synth and retro midi tracks have the Castlevania feel—a high bar to meet and a feat within itself. While the story and presentation are generally low-key items in Escape Goat, the true bread and butter of the game is found in the gameplay. The game can boast on three major points: addictive twitch gameplay, clever puzzle design, and amazing level design. The task of Escape Goat is always the same—get from the starting point to the exit door in a room by collecting keys and not dying. 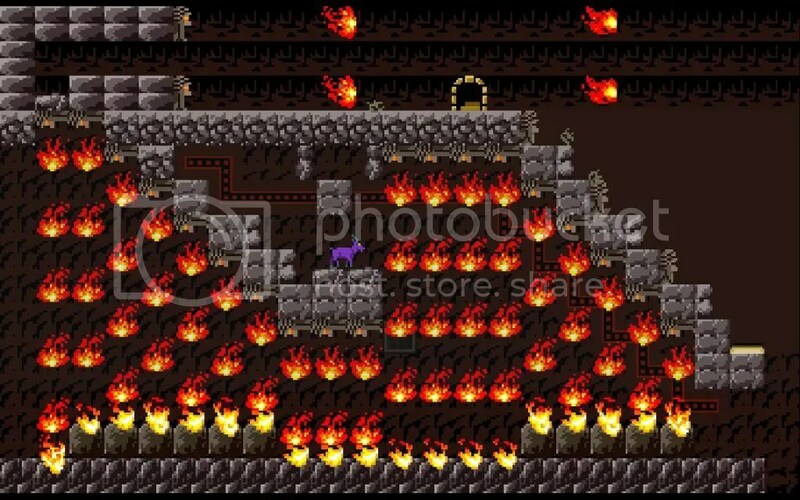 Do this enough times until you get to the last room with the sleeping sheep. Like normal platformers, the main action of the game is jumping from obstacle to obstacle avoiding various things that may kill you. In this case, it includes anything from grim reapers, wall-saws, or fireballs. One of the quirks of the game is that there is no direct way to injure things—the goat has a dash function but it does little other than add some speed and distance to the jumps. The game therefore has more of a focus on avoidance, puzzle solving, and sometimes stealth than other components. The beauty of the game comes around its learning curve. Though the game starts with basic puzzles, soon the game transforms into avoiding pillars of fire and luring enemies to their own deaths. Whether you are a first-time gamer or more experienced, expect to die—a lot. In my first play-through, I died somewhere in the triple digits. This is expected though; dying is hardly a punishment as the game will just restart the room over again. Additionally, it is evident how much work and love the developers put into the level design. Each room, while containing the same flavor of the overall group (fire, mechanical, ice, etc. ), will have its own individual puzzles that would keep me constantly on my toes. While other platformers may have you jumping from ledge to ledge, Escape Goat makes you first uncover that ledge through various moving parts. Due to the care that MagicalTimeBean put into the game’s development, the game will only last a few hours—on my longest playthrough it was three hours and on my shortest 45 minutes. However, completing the game unlocks the blistering “All Intensive Purposes” mode that will have the most seasoned veteran playing for hours on end. 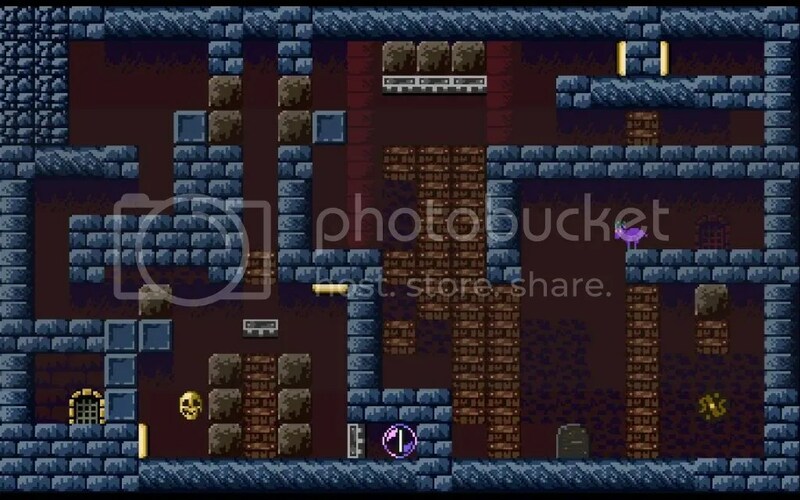 Additionally, the developers include a level creator to allow an endless possibilities for levels. 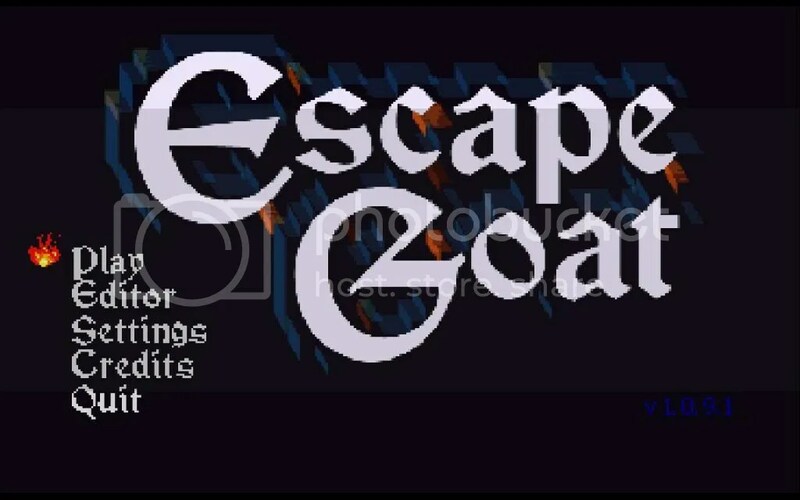 Escape Goat, while not being the most technically impressive, is a fun game that will test your brain and reflexes. While it does little to add or improve aspects of the tried-and-true platforming equation, it is a great fix for those missing the 8-bit games of an earlier age. Crysis 3 is the third game in a cool franchise of post apocalyptic alien shooters and is arguably the most enjoyable, in my opinion. The Crysis games are not your typical “bro-shooters”, like Call of Duty or Halo, that everyone plays. Zone of the Enders was originally released in 2001 and was followed in 2003 by its sequel Zone of the Enders: The 2nd Runner. Both games received good reviews, averaging around an 8/10 from most major reviewers. It has been 11 years since I first played Kingdom Hearts and my love for this game has only grown stronger. Merging Final Fantasy with Disney was one thing Square-Enix absolutely did right over the past decade or so.